Make sure all A/V equipment is working properly. Go over discussion points with your facilitator. 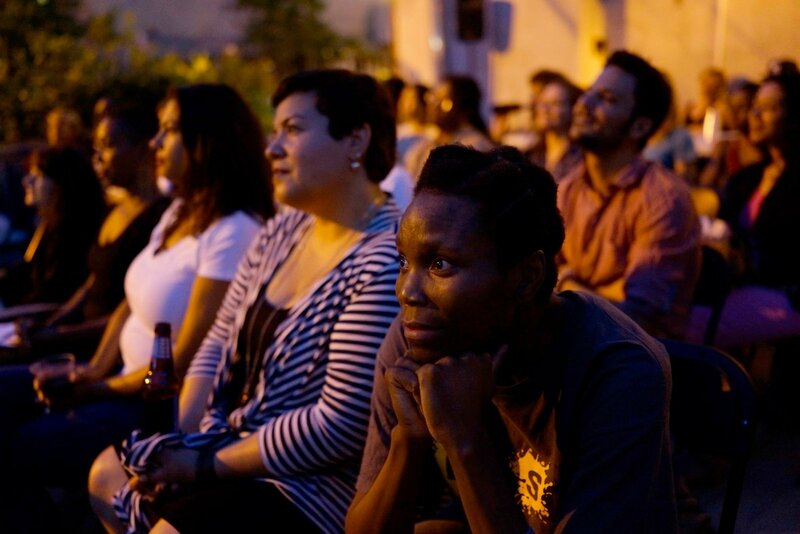 Take photos during your event—send them to us at events@pov.org or tweet them at @povdocs! Pass out audience evaluation forms and pens or pencils. Announce the local broadcast date (if applicable). Share DVD purchase information (if applicable). If you are expecting a large audience, plan to break participants into groups for discussion following the screening of the film. — Reserve the last half-hour of your event to strategize about follow-up activities. — If you have a newsletter or listserv, pass around an email sign-up sheet at the event. — Do a head count. This can be helpful information to have when you are reporting on your event. — We occasionally feature partner organizations on the POV website. This can be a great way to promote your organization. Email events@pov.org and we’ll get in touch to talk about featuring your event on the POV website. Log back into the POV Community Network and fill out your event coordinator evaluation. — Identify your own hot-button issues. View the film before the event and give yourself time to reflect so you aren’t dealing with raw emotions at the same time that you are trying to facilitate a discussion. You don’t need to be an expert on the issues, but knowing the basics can help you keep a discussion on track and gently correct misstatements of fact. Visit the Discussion Guide for the film and review the Background Information section; you may want to take a look at the websites and articles suggested in the Resources section, too. — Be clear about your role. You may find yourself taking on several roles for a single event, including host, organizer—even projectionist. If you are also planning to serve as facilitator, be sure that you can focus on that responsibility and avoid distractions during the discussion. Keep in mind that being a facilitator is not the same as being a teacher. A teacher’s job is to convey specific information. In contrast, a facilitator remains neutral, helping to move the discussion along without imposing his or her views on the dialogue. — Issues can play out very differently with different groups of people. Is your group new to the issue or have the members of the group dealt with it before? Factors like geography, age, race, religion and socioeconomic class all can have an impact on comfort levels, speaking styles and prior knowledge. Take care not to assume that all members of a particular group share the same point of view. — Consider how well group members know one another. If you are bringing together people who have never met, you may want to devote some time to introductions at the beginning of the event. — Agree to ground rules regarding language. Involve the group in establishing some basic rules to ensure respect and aid clarity. Typically, such rules include prohibiting interrupting, yelling and the use of slurs, as well as asking participants to speak in the first person (“I think . . .”) rather than generalizing for others (“Everyone knows that . . .”). — Try to give everyone an opportunity to be heard. Be clear about how people will take turns or indicate that they want to speak. Plan a strategy for preventing one or two people from dominating the discussion. — Talk about the difference between dialogue and debate. In a debate, participants try to convince others that they are right. In a dialogue, participants try to understand one another and expand their thinking by sharing viewpoints and listening actively. Remind people that they are engaging in a dialogue. This will be especially important in preventing a discussion from devolving into a repetitive, rhetorical, political or religious debate. Ask the group to think of the event as being about listening as well as discussing. Participants can be encouraged to listen for things that challenge as well as reinforce their own ideas. You may also consider asking people to practice formal “active listening,” in which participants listen without interrupting the speaker, then rephrase what was said to make sure they have heard it correctly. — Remind participants that everyone sees through the lens of his or her own experience. Who we are influences how we interpret what we see. Everyone in the group may have a different view about the content and meaning of the film they have just seen, and each of them may be accurate. It can help people understand one another’s perspectives if, in addition to sharing their views, speakers identify the evidence on which they base their opinions. — Take care of yourself and group members. If the intensity level rises, pause to let everyone take a deep breath. You might also consider providing a safe space for participants to “vent,” perhaps with a partner or in a small group of familiar faces. If you anticipate that your topic may upset people, be prepared to refer them to local support agencies or have local professionals present. Think carefully about what you ask people to share publicly, and explain things like confidentiality and whether or not press will be present. Please be sure to pre-screen the film to make sure it works properly with your equipment. If you create any promotional materials for the event, pleaseemail them to us at events@pov.org before you send them out. If you plan to contact any press about your screening, please email us a Media Contact Form. We’ll also help promote your event on POV’s Twitter and Local Screenings Map. Therefore, please let us know as soon as possible if your screening date/time changes for any reason. screening by visiting our Resources page, or the film's listing in the POV Community Network. In your screening package you’ll find materials for your use, including audience evaluations. Collecting audience feedback is an important part of the work we do and helps us gauge the community’s needs. All personal information is strictly confidential, and we will quote audience members only if they authorize us to do so. Return the DVD to us and fill out your coordinator evaluation online at communitynetwork.amdoc.org.